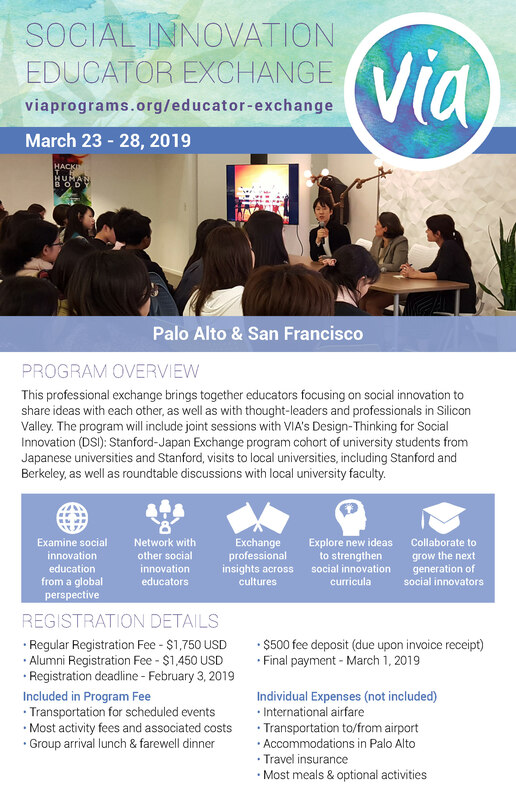 This professional exchange brings together educators focusing on social innovation to share ideas with each other and thought-leaders and professionals in Silicon Valley. 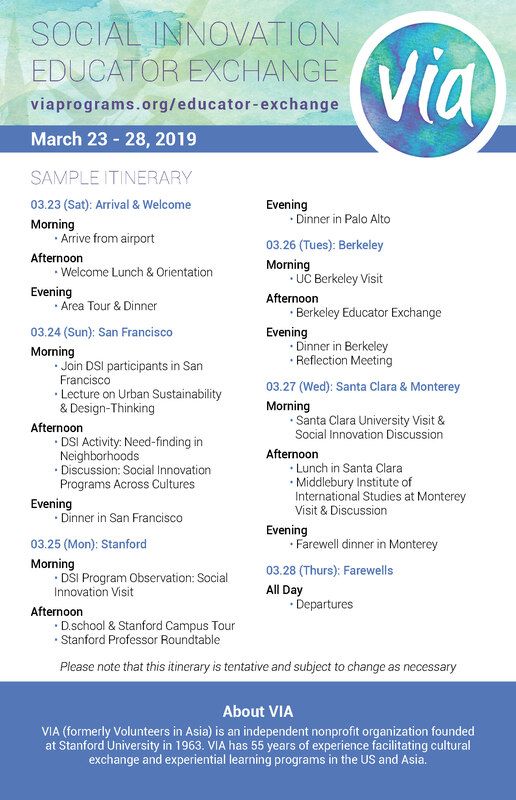 The program will include joint sessions with VIA’s Design-Thinking for Social Innovation (DSI) program cohort of university students from Japan and Stanford University, visits to Silicon Valley companies and campuses, and roundtable discussions with local university faculty. To register for this program, please click the blue “Apply” button and complete the registration form. After you complete your registration, you will receive an email confirmation. The program director, Yi Zhang, will be in contact after the deadline to follow up and discuss your interests in more detail. Travelers with passports issued from Japan, Taiwan, South Korea, and other regions included in the US Department of State’s Visa Waiver Program (VWP) do not need to apply for a visa to enter the United States. VWP enables most citizens or nationals of participating regions to travel to the United States for tourism or business for stays of 90 days or less without first obtaining a visa. Travelers must apply and be approved through the Electronic System for Travel Authorization (ESTA) prior to travel. If you prefer to have a visa in your passport, you may still apply for a visitor (B) visa. Travelers from regions not included in the VWP must apply for a B1/B2 visitor visa. VIA will provide a visa invitation letter as proof of participation in this program to participants who require a B1/B2 visitor visa.